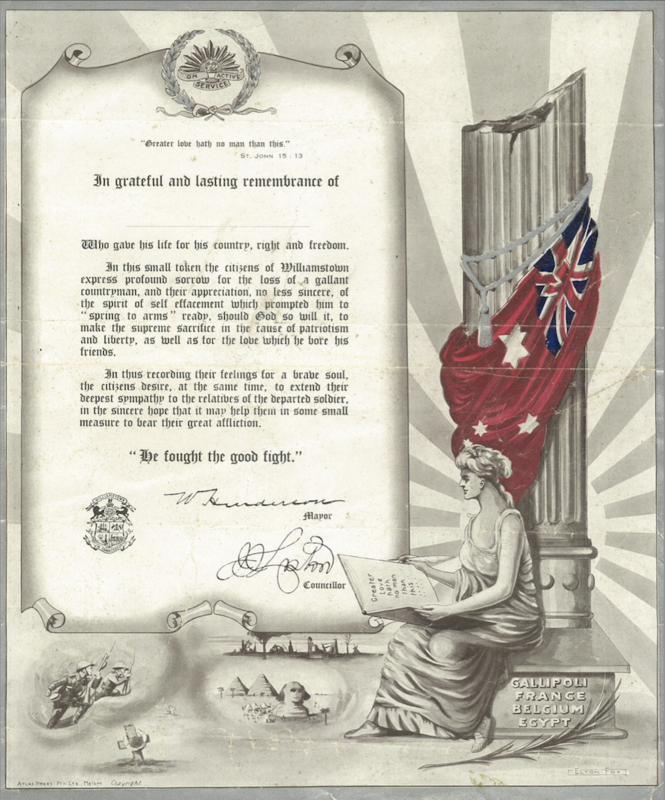 Australia initially embraced the declaration of war on 4 August 1914. The Government’s promise of 20,000 was soon met. By the end of 1914 over 50,000 had enlisted and thousands more had been rejected for not meeting the medical and physical requirements. When the war ended in 1918, from a population of fewer than five million, over 400,000 Australians had enlisted. From Williamstown, Spotswood and Newport close to 1800 answered the call to war. At least 265 gave their lives. From Williamstown, Spotswood and Newport close to 1800 answered the call to war. They served as soldiers, sailors, airmen, doctors and nursing staff. Many returned home but some were to die within a few years from war related injuries. Families and communities continued to pay the price of war for decades. We know at least 265 gave their lives and possibly more perished. The 265 servicemen on our Honour Board were butchers and bakers and sailmakers, plumbers, miners and grocers. Our research found bankers, lawyers, engineers, draughtsmen and architects, a cook, a carpenter, a bookkeeper, a piano maker, labourers and clerks. Many men worked for the railways, the docks, the bottle works. Come Along Boys – Enlist Today! 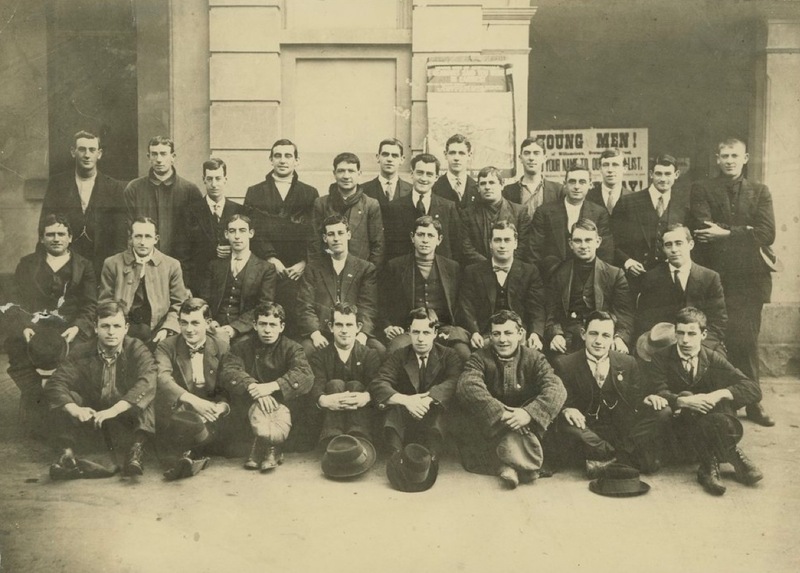 Australia was full of well-trained men prepared to fight as a result of the Defence Acts of 1909 and 1910 making military training in time of peace compulsory for men and boys and there were many varied reasons for enlistment. Apart from the initial patriotic obligation to protect King and country, many signed up for adventure and travel – an opportunity to see and experience lands and customs otherwise unavailable to most Australians at that time. Many joined due to financial hardship. There was widespread unemployment, especially in the country areas that had been affected by a prolonged drought and the Australian army paid well, regularly and on time. Our research on the men of the Williamstown Town Hall Honour Board has revealed letters from soldiers to their families telling them to keep and use their pay for household expenses. The first campaign for Australia was when the Australian Naval and Military Expeditionary Force (ANMEF) was dispatched to seize German possessions in New Guinea and the islands of the Bismarck Archipelago in October 1914. At the same time the First Australian Imperial Force (AIF), initially consisting of 20,000 men, was raised for service overseas. On 1st November 1914, Australian and New Zealand troopships departed in convoy from King George Sound, Albany, Western Australia. Australian and New Zealand men and women served in Gallipoli including members of the nursing contingent. The Gallipoli campaign began when Australian, New Zealand, British and French troops landed on 25th April 1915 and ended with an evacuation eight months later in December 1915. Australian casualties totalled 28,150 including 8,709 killed. By early 1916, recruiting in Australia had raised sufficient troops to replace the losses at Gallipoli. The AIF regrouped and most of the units were sent to the Western Front. The rest of the troops fought in the Middle East campaign to defend the Suez Canal and the Sinai Peninsula and remained there until Turkey surrendered in October 1918. The AIF took part in many of the major battles of the Western Front from 1916 to 1918 and the loss of lives and injuries were heavy. Of the over 181,000 men who fought there, more than 46,000 died, 114,000 were wounded, 16 000 gassed and almost 4000 taken prisoner. Of the total deaths per 1000 men mobilised, the Australian Imperial Force figure was 145 – the highest of all the British Commonwealth armies. By the time the war ended in 1918, from a population of fewer than five million, over 400,000 Australians had enlisted, close on half of the eligible male population. Almost sixty-five percent of those became casualties. One man in five Australians was killed on active service. Just over 60,000 were killed and 156,000 were wounded (permanently crippled and maimed, gassed, blinded, and shell shocked) or taken prisoner. 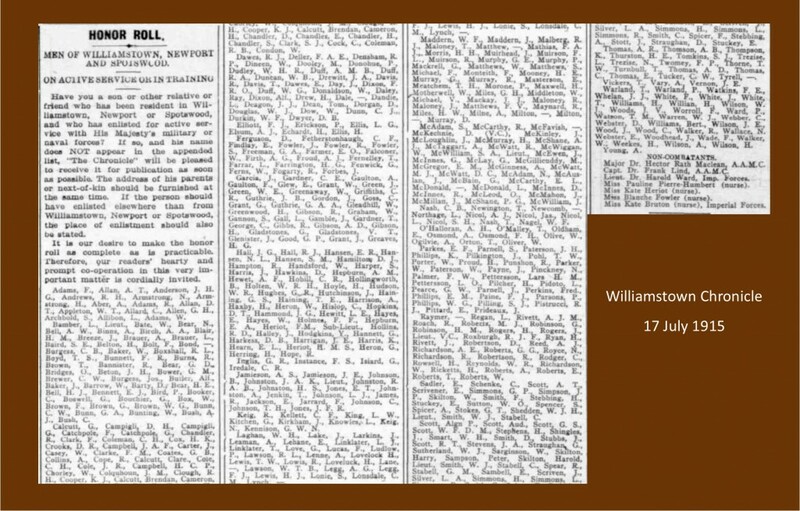 The men on the Williamstown Town Hall Honour Board fought in the many theatres of the war. They served in the Military, the Australian Flying Corps, the Royal Australian Navy and the Merchant Navy. They carried out operations at Gallipoli, the Middle East, the Western Front, the North, Adriatic and Black Seas. Albert Taylor enlisted in the 2nd Pioneer Battalion before transferring to the Australian Flying Corps in August 1917. He was appointed Flying Officer/Observer and promoted to 2nd Lieutenant in December 1917 and appointed Lieutenant in March 1918. Read Albert’s connection to the Red Baron in his biography. They were of all ages ranging from 18 to 45, although we believe that Leslie Raymond Moore was only 14-15 when he first enlisted in the Navy. Wallace Bruce Duncan was only 17. He enlisted as being 18 years and 3 months. His mother gave her consent as she was afraid her son would enlist under a false name and she’d would never know his fate. 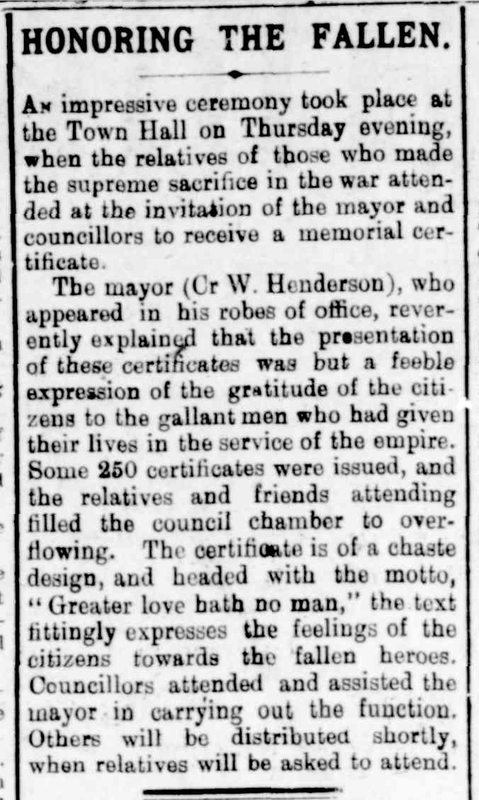 The men who went to war were brothers – the Fells, Muirsons, Calcutts, Chandlers and Lennons. They were cousins and neighbours. Many brothers and cousins enlisted, embarked and fought together. Some saw their relatives killed, some searched for the missing, many buried their brothers and friends. When Private Joseph Gilbert was killed on 11 August 1916, he was found and buried by his brother, Charles. In his distraught state Charles buried Joseph with all his belongings including his identity disc. Fourteen years after he died, Joseph’s belongings were returned to his mother with the words ‘These mementos, though now greatly impaired through long exposure will doubtless be valued on account of their former intimate association with your son’. All of these men are remembered on the Williamstown Town Hall Honour Board.